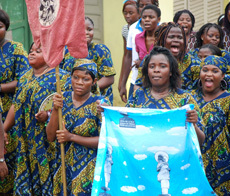 Fifty years after the country’s independence (1968) from Spain, the cult of the Virgin of Montserrat is truly alive in the current territory of Equatorial Guinea,. During the colonial period, the image of La Moreneta was exported, and over time it began to acquire new meanings and representations. The Spanish colonial system was essentially based on Catholic missions, which, with the monopoly of the educational system —and often of many territorial jurisdictions— played a very important role of power over the different colonised groups. They were an agent who, despite their philanthropic discourse, led a very aggressive acculturative action. In this regard, it is important to point out that the missions were led by the Claretian order and, as a result, by a Catalan majority whose religious referent was the patron saint of Catalonia. Aware of the fact that the black virgin could potentially be exploited to facilitate self-identification and assimilation among the population, they rooted their patronage in different places on the island (Luba, Rebola and Las Palmas). Nevertheless, the arrival of the first image was not only an ecclesiastical milestone, but it was also funded by the community of business residents, the majority of whom were Catalan. Therefore, its arrival also had the function of bringing together symbolic referents from the community. However, it was the sculptor Modest Gené who changed the history and meanings of the image in the territory. The artist worked on religious imagery assignments, and sculpted the replica of La Moreneta that can be found in the sanctuary of Luba. After that work, the evolution of the figure acquired new meanings, and was syncretised with cultural borrowings from local ethnic groups. Some examples of this are La Virgen del Maestro, N.S de Rio Muni and the Moreneta de Efulan —which is represented with the characteristic traits of the Fang ethnic group— and the Verge de Bisila. 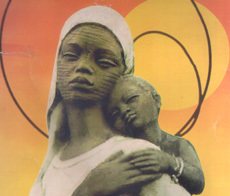 Our study has focused on The Virgin of Bisila as a product of colonial otherness. 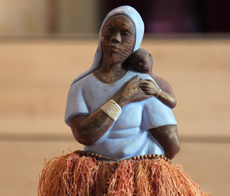 Bisila was the mother spirit of the Bubi people and through religious action she was Christianised until she became the patron saint of the island of Bioko, canonised by the Catholic Church. 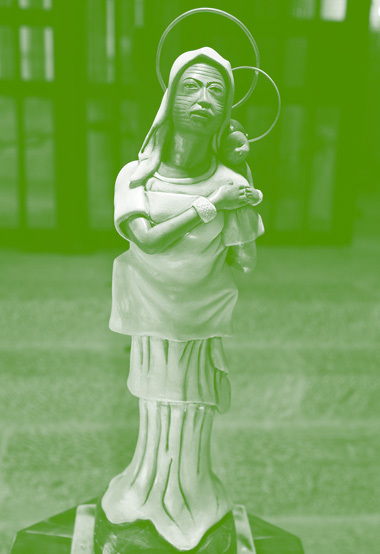 This representation of Bisila included characteristic traits of the Bubi people, generating new forms of worship and postcolonial conflicts in relation to the appropriation of the image, which take place both in Equatorial Guinea and in transnational contexts.